Review: I'm a huge Bad Religion fan. I always have been and always will be. Few bands offer up such ferocious energy and poignant messages in their music. 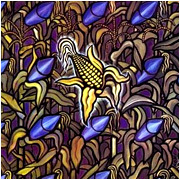 For me, Against The Grain was the true beginning signs of the band greatly maturing in terms of their ability to craft a song. While I absolutely loved "Suffer" and the blazing speed of "No Control", "Against The Grain" really took things to a whole new level both with the quality of their music. The lyrics are absolutely masterful and catchy as hell covering everything from politics to religion... but anybody familiar with Greg Graffin's writing would expect nothing less. His lyrics are the kind that get in your head, not just because they're so catchy, but because they truly make you think about the world. What really changed on this album was how the vocal harmonies were greatly improved over their previous, more stripped down punk efforts. This was a major evolution for the band and really made them stand out from the rest of the punk pack even moreso. I also noticed that the songs on ATG were a bit more complex as well. Just listen to a song like "Anesthesia" and compare it to anything they had previously done and you'll notice a distinct change in their musicianship. Brett Gurewitz really grew a lot as a musician as you'll quickly notice in both the songwriting and in his guitar solos. The titular track is a fantastic example of how the band was growing tremendously as the music had a greater sense of purpose and urgency to it. I challenge you to take just one listen and try to resist the urge to tap your feet to the rhythm of the music. With a long history, the band has released plenty of albums, and many of them have songs that I can do without. That's not the case with Against The Grain however... there's not a single sleeper on the entire seventeen-track album. Indeed, this is the album which I felt Bad Religion really came into their own and that's probably why I've listened to it more than any of their other releases. I don't give out the coveted five pickle rating too often, so you know I'm not kidding when I say how important this album is to me. I simply can't recommend it enough and it's a great place to start in their extensive catalog if you're new to the band. The only thing I currently have is the first two volumes of "Punk-O-Rama", and "The Process of Belief". Guess I need to fix that. I Want to Conquer the World rules. That's kind of random as I don't even think it's on this album. This is truly a great album, but I think I prefer Suffer, No Control, and The Process of Belief. Guess I'll have to re-educate myself! I will say that you are right. One of the best bands out their I love against the grain, but I prefer Recipe for Hate in instead.